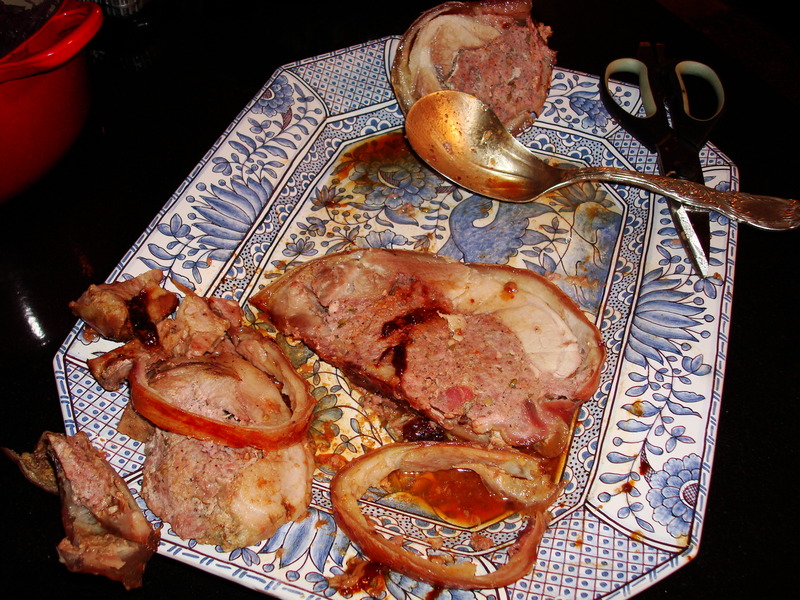 Adapted from “Roast Leg of Pork (Fresh Ham) with Cracklings,” in The Complete Meat Cookbook, pp. 348-349. “What is THAT?” I shrieked, startled by the sight of an eighteen-inch pig’s leg — hoof and all — draped across other cuts of meat in the butcher’s display case. Zampone, said Danny, the owner of the world’s finest little grocery, Taylor’s Market. It was the first one he had ever made. A week or so before, he noticed that a fancy food catalogue offered a frozen boned pig’s foreleg stuffed with Italian sausage for $225. “Hell, I can make that!” And better yet, he can make it fresh, skin on (most thrillingly), and sell it for $50 flat. The photograph in the catalogue showed a roasted pig’s foreleg of a golden hue that can only mean one thing, crackling, the Holy Grail of pork lovers. It lay on a bed of lentils, apparently the traditional accompaniment of this dish that northern Italians eat on Christmas Eve. At home, I searched the web for zampone recipes. Every recipe I found sounded disgusting. I’m supposed to wrap the leg in cheesecloth, put it in a roaster, fill it with water, poach the leg, and slice it to serve. Not bloody likely! No site proposed a way to roast it. When you need a meat doctor, there’s only one guy to call: Bruce Aidells. I pulled out my copy of The Complete Meat Cookbook and began my research. His recipe for Roast Leg of Pork with Crackling looked most suitable. And simple, I might add. So, the zampone I bought weighed six-and-a-half pounds. I’m counting on feeding eight people tonight. We plan to eat at 7 pm. The only equipment I need is a roasting pan and a meat thermometer. The strategy is Low and Slow. 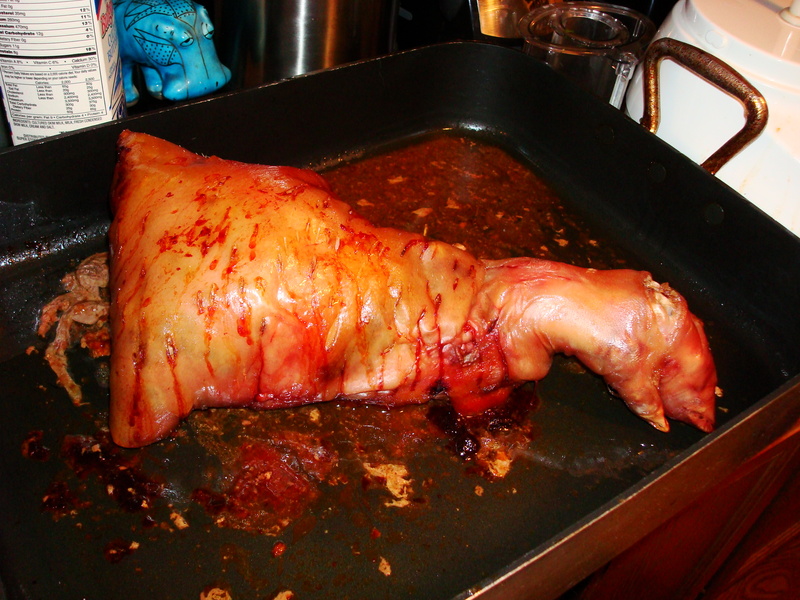 To prepare the leg, I placed it in the roasting pan, skinside up, sewn-together-side down. With a sharp knife, I stabbed the leg all over. Aidells recommends hundreds of little slits all over the skin. I suppose the release of juices helps produce crackling, but he doesn’t say so. 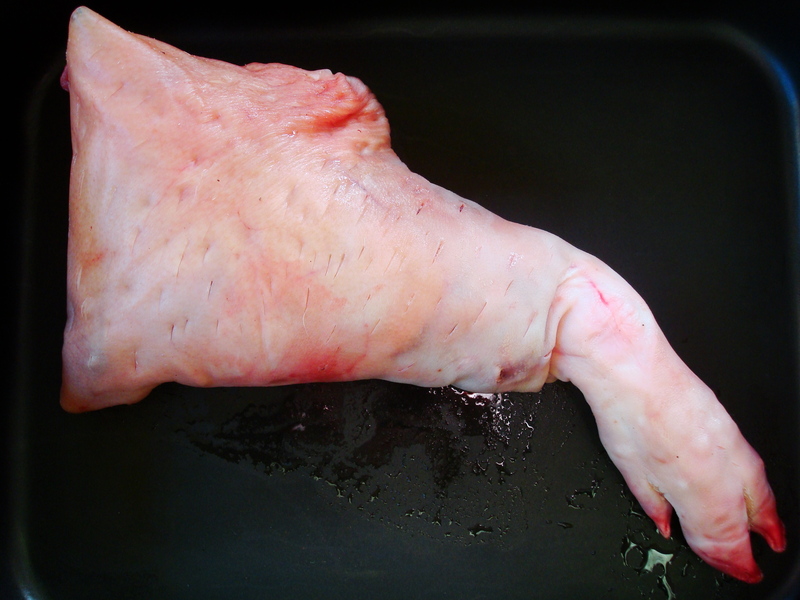 He does warn, however, against basting the leg during the roast, because basting reduces the crispiness of the skin. 3:30 pm: I put the roasting pan in a preheated oven set to 300. I expect to roast it for three hours. My goal is for the interior temperature of the leg to reach 145 F. Aidells sears the meat at the beginning of the roasting period. I’m following my friend Ann’s advice. Over in London, where pork roasts often come with the skin still attached, she has found that a slow roast at a low temperature works well if she has to run errands. About twenty minutes before it reaches temperature, she turns up the heat to 475 F to induce the crackling effect. The timing of that could be a little tricky. 5:30 pm: After two hours, the internal temperature has reached 131 F. The outer skin is deep gold. I don’t want it to be ready before 6:15, so I’ve turned down the temperature to 250 F. At 6:15, I’ll crank up the heat to 475 and watch it carefully. 6:10 pm: Holy Toledo! The temperature shot up to 150 F! Out it comes. Now to let it rest for half an hour. 6:45 pm: Eight of us sit down to a sumptuous meal of zampone, lentils, mashed potatoes, sauteed red cabbage, and creamed spinach. The zampone delighted everyone, but we all agreed that the crackling was too tough, the sausage dominated the pork meat, but the juice was heavenly. The juices of the zampone enriched the lentils with sweet high notes. All the food was complementary. Holiday meals are supposed to be filling. This one filled the bill. I’ll be picking up a zampone from Taylor’s for Memorial Day (I know, very much out of season). I didn’t want to boil mine either, so it was good to see this post. Thanks for the cooking info!! It’s always zampone season. Enjoy it!